and was confirm tonight when Kroha told me that Detroit Original garage rock band "the Gories" are getting back together aging and will go on tour in the spring or early summer 2009.
it was so painful neither Mick or Peggy would not talk about the break up, but in the last year thing was Begin to cool, i should know last year at friend birthday party at the Old Miami in Mid-town Detroit i did saw both mick and Peggy talking to each other at the party, it was real cool to see. the talk about the Gories reunion began almost two weeks ago when Reigning Sound mainman Greg Cartwright posted a simple confirmation on the Goner Records message board that the Gories would re-unite for two U.S. shows this summer with fellow rockers "the Oblivians" and they would be playing two show, one in Detroit, one in the "the Oblivians" hometown of Memphis and a two weeks in Europe. The story was confirm on the official my space site [http://www.myspace.com/therealgories] post here. 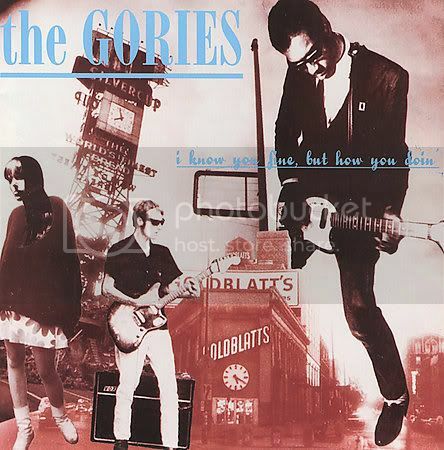 , the big question now is where in Detroit will the gories will played? or will it be at the Larger House. it will be a long wait when know where the Detroit show will be playing. Stay tune and plug in. Dan Deacon has gathered artists from Wham City, Tarantula Hill, and other crews in the Baltimore music scene for the Baltimore Round Robin Tour. A two evening event in which bands set up and perform on the periphery of the performance space and trade off songs around the room several times while audience stands in the center of the room. dancing or thrashing manner. Finally, the inexplicable "Weird Round" will feature additional artists, misfits, comedy acts, Dj's and other improvised randomness peppered in throughout the nights. Saturday - My Dear Disco - CD Release Party!! Saturday - Rock N Rummage Fall Extravaganza! Friday - Wierd Records New York City presents:Martial Canteral w/ Bad Party and Red Rot. DJ set by Wierd Records Pieter Schoolwerth. In a programme first broadcast in 1988, Ranking Miss P and Patrick Meades highlight some of the jewels of the vast Trojan Records back catalogue of ska and reggae. They discuss the stories behind the songs including The Upsetters’ ‘Return of Django’, Bob and Marcia’s ‘Young Gifted and Black’, Tony Tribe’s ‘Red Red Wine’, Dave and Ansell Collins’s ‘Double Barrel’, ‘Soul Shakedown Party’ by Bob Marley and the Wailers, Dennis Brown’s ‘What About the Half?’, Susan Cadogan’s ‘Hurt So Good’ and Lee ‘Scratch’ Perry’s ‘All Things Are Possible’. Tuesday - Part 7 - Livin' For the City. Wednesday - Part 8 - Three Times A Lady. Thursday - Part 9 - Let's Get Serious. Friday - Part 10 - Happy Birthday To Ya! The Kings Of Leon co-host Left Of Center afternoons during the week of October 6th. Kings of Leon will introduce you to their brand new album, Only By The Night. Beck takes you through his new album Modern Guilt track-by-track. He’ll also play some of the music that influences and inspires him. Throughout the weekend Left of Center will feature music from throughout Beck’s career and air a live performance from his Modern Guilt tour. Every week, etown features live performances and interviews. This week, more from David Crosby & Graham Nash?Ani DiFranco?James Taylor + others! Part 2 of a show recorded in Denver during the DNC!! Fembots drop by to play tracks from their latest release "Calling Out" and discuss the unique foundation to their music of Junkstruments. Jackson is releasing his first album of new material in six years on September 23rd "Time The Conqueror" and sat down with Mike Marrone on the eve of his World Tour for an extensive music centered conversation that includes his thoughts on a wide range of artists and topics. From David Crosby and Graham Nash to The Beatles and Kris Kristofferson. From Nico, Andy Warhol and the Lower East Side of New York in the 60s to Southern California in the 70s, Jackson is candid, glib and very funny throughout. 5. joe lean & the jing jang jong - where do you go? 15. lp session 1 little man tate "nothing worth having comes easy"
23. lp session 2 the aliens "luna"
24. Poppy and the Jezebells- U.F.O. 27. The Kooks- Do You Wanna?